Tomorrow morning, Karen and I are flying to Guam to celebrate our 25th wedding anniversary (March 8th) with warm weather and some scuba diving. 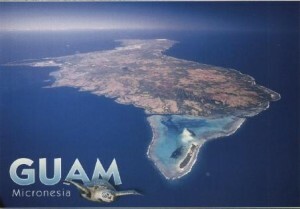 We have been to Guam once before and enjoyed it very much. Praise the Lord for all of the beautiful places He has created and for airline mileage programs that give us free tickets! The Japanese have shown great interest in Christianity several times during their history. But each time, various things happened to block the progress of the Gospel. 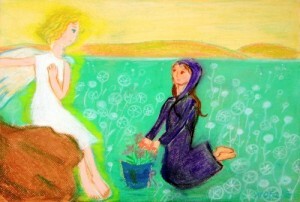 Now, once again, there seems to be an awakening of an interest in Jesus and the Christian message. The people showing interest are still a small percentage of the population, but the interest in Christianity is still far stronger than at any time since the years right after World War II. 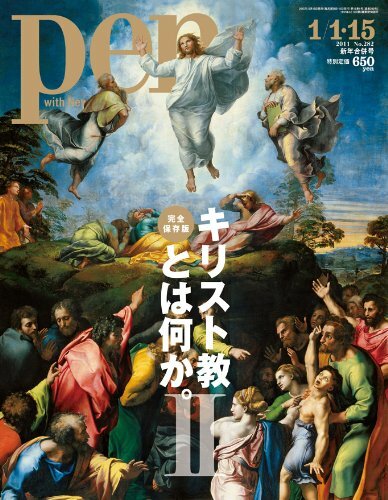 Interestingly, the Japanese are going to the secular media to learn about Christianity instead of coming to church. The secular media is responding to this interest since book and magazine publishers are happy to print whatever sells. Please pray for the Lord to touch hearts and open minds to the truth! You can read more about this interesting trend in this Asahai News article. Yesterday we had an excellent baptism explanation meeting. 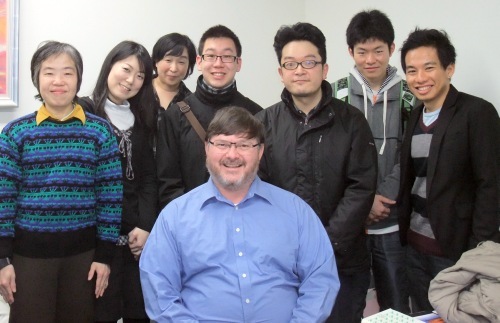 Keiko’s Alpha Course group is nearing completion of the course and several people were asking about baptism. Even though I am on sabbatical, I had stopped by the church office for some other things when Keiko saw me and asked if we could have a baptism explanation meeting immediately. So, at the end of the Alpha Course meeting, she invited anyone who wanted to stay to come and talk about baptism. A couple of people had to leave, but the rest of the group stayed. Three people asked to be baptized next month, and one more said he wants to get baptized this July when we have our OIC summer retreat at the beach. From this group, there are also three people who want to be trained to be Alpha leaders for the next course. Praise the Lord! And a super-big praise because Keiko, the group leader, was baptized less than a year ago right after she completed the Alpha Course. On a lighter note, I laughed when I saw this truck today. Hot Sweet Potatoes for Sale! It was way too warm out today to be eating hot sweet potatoes off the truck; that is winter food! 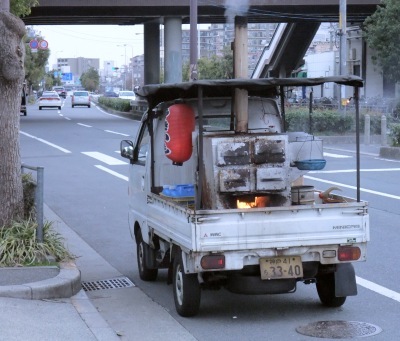 Of course, in the USA, you don’t often see a truck with an open charcoal oven in the back, but here they are not so rare. The weather was warmer today in Osaka and we got a little rain, so it feels like spring is coming soon! In between proof-reading a sermon translation with Yuko and reading some Good News, I took a bicycle ride to Osaka Castle Park. In Japanese history, there is a Christian woman called Lady Gracia whose story is closely associated with the castle’s history. Japanese Catholics and Protestants both consider her a hero of the faith and a martyr. You can read part of her story at Wikipedia. The famous theologian, Tertullian, once said,”the blood of the martyrs is the seed of the church.” Japan has had uncounted martyrs probably numbering to hundreds of thousands. Lord Jesus, we ask you to bless and grow your church in this land where so many have died for Your Name! Japanese people often insist they are not religious, but shrines and temples are everywhere and they do a booming business. 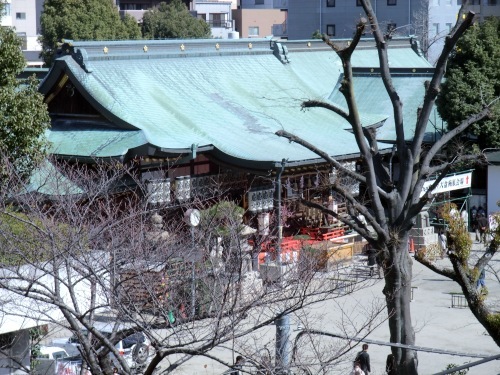 Here is a photo of the Tenmangu shrine and also a photo of the place where prayers are hung on wooden tablets. At this shrine and at this time of year, the prayers are almost all for, “passing exams,” since the Japanese school year ends in March and final exams have already started. People pay 2,000 yen (about $24) for each tablet and I estimated that about 10,000 tablets were hanging on the display. That is almost a quarter-million dollars of prayer tablets. If you go to the reception desk, you can arrange for a Shinto priest to say a special prayer – but that costs much more than a wooden tablet. At Shinto shrines, nearly everything costs money, sometimes lots of it. But like in real estate, there is a feeling that the more you pay, the better product you will get, so many people spend extravagantly on special prayers and numerous good luck charms. May the Lord Jesus open the eyes of these people to see how foolish all of this is and lead them to salvation! 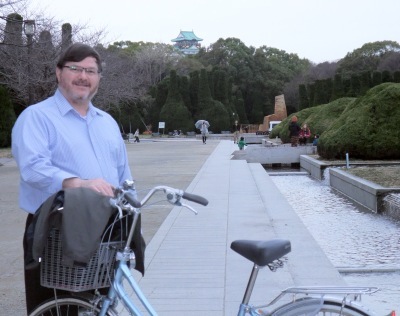 During our sabbatical from OIC, Karen and I plan to visit various Osaka churches and deepen relationships with the wider Christian community in our area. 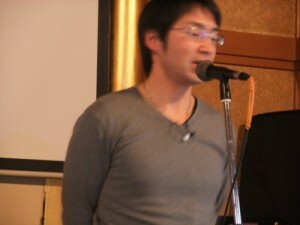 Yesterday, we visited Hope Chapel Osaka and heard an encouraging message from a young Japanese man named Ryo. 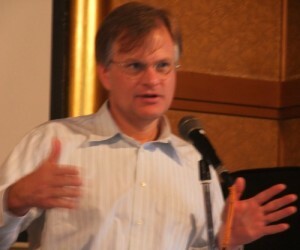 Pastor Jeff also shared a few words and I made a plan to meet with him on Wednesday for coffee and to talk about evangelism in Osaka. At OIC, we have a church artist – a Japanese woman named Noelle who paints and often donates art for use as birthday gifts, Christmas presents, and sermon illustrations. On the average, Japanese people are more visually-oriented that Westerners and art is a powerful way to share the gospel. I was reminded of this yesterday when I visited an art show in Kobe where some of Noelle’s work was being displayed. Japanese study is a more or less permanent part of life. Of course, as your level goes up, the type of things you study change – in the beginning you are just learning greetings and polite words, later (15 years later in my case), you are trying to find the best ways to phrase things to touch Japanese hearts when you write or preach in Japanese. But you never finish. Language learning is lifetime learning. If you are tackling Japanese or another language, perseverance is the key – never give up! Pray for Methuselah’s life span and the wisdom that Solomon had. The mighty power of Samson to carry the heavy load. The zeal and fire of Paul–boy, this language will lay you low!! When we read this, we laugh at the clever humor. But many new missionaries get discouraged and weep. Take this opportunity to spend a moment in prayer for all of the missionaries around the world who are struggling with language studies. Pray for me also, that I might find words that really open hearts and minds to Jesus.